*I thought I was shooting with my lens in automatic focus… but it wasn’t… and I was too nervous? to realize. Susannah, next time I’m in NYC I need a do over! FUN: I just went on vacation with my husband to the UK and took a sleeper train up to Scotland. I had an amazing time. It was just one of those vacations where we didn’t really have any plans, we didn’t know where we were gonna go next, and it was really fun and exciting! We went on a whim, and it was the best vacation ive ever had. It was awesome. 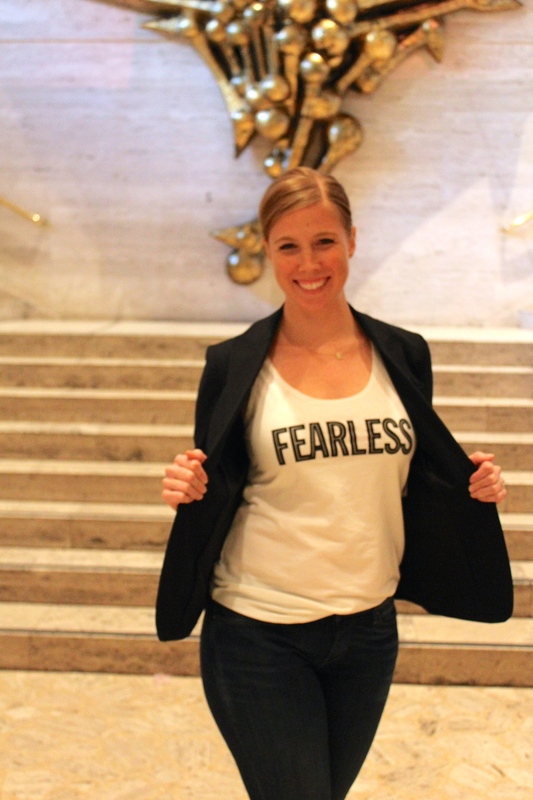 FEARLESS: I grew up outside of Boston in a small town and I worked at Boston Magazine. I got my first magazine job in NYC at O, the Oprah Magazine, and so that was intimidating for me. But I loved it. I felt fearless doing [moving to NYC]. FOOD: BAGELS! Bagels and cream cheese! I f-ing love bagels and cream cheese. I could eat it breakfast, lunch, and dinnr for the rest of my life. FLAVOR (of bagel): Honestly, I’m a basic girl. I like a plain bagel, or a seaseme bagel, and and cream cheese. Toasted well. I feel like I need to get one on my way home, a bagel snack! F WORD: I don’t think anyone has ever asked me this. F word? Fabulous! That’s now my favorite f word! This entry was posted in F Stop, Interviews and tagged cosmo, cosmopolitan, fearless, fun, funfearlesslife, nyc, people.